I'm taking over comms for a bit as Nate goes to retrieve his notepad from Sauber. Which team is most surprising, positively and negatively? ... Haas/ForceIndia and McLaren/Renault? It's hard to tell at the moment, but McLaren and Renault have struggled for mileage so far. Haas has made a reasonable start to testing, but are not planning any upgrades before Australia. Force India has struggled with reliability on and off and had an engine issue earlier today. For those asking, there's been no sign of the McLaren for about four hours. @Laurence Are Alonso and Vandoorne wasted talents right now? @Openthedrs I think it's always a shame to have a driver of Alonso's talent and experience struggle because of the car. 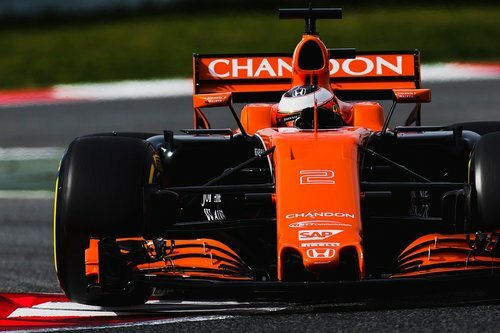 Vandoorne has a lot more time on his side and I'm pretty convinced he'll get his chance in the future. But it's early days at the moment and we'll see if the McLaren starts to pick up. Someone with a good knowledge of aero and the technical side of F1 just walked into the media centre and said "Well, this year is going to be rubbish" - he's just spent the afternoon trackside and does not see how cars are going to be able to overtake each other this year. It's only one person's opinion, and there are lots of them in the paddock. Certainly these cars are going to be significantly harder to follow than previous iterations, but that doesn't necessarily mean overtaking in general will be worse off. Is it bad that i just let out a verbal "Uh Oh"
So is this someone right? Is there any proof during the test that when cars close up they slide all over? ... and using 'Rubbish" means that person was British. Good news McLaren fans - but how many laps can they do in just under 90 minutes (and counting)? Overtaking has been always difficult in F1. Back in the V12-V10 era, there was hardly any on-track overtake. What's exciting in F1 is the chase down and on-track defense of drivers. I think we will see a lot of Max inspired overtakes this year. Any overtakes that do happen, especially outside of the DRS zones will for sure attain greater prominence is my feel. I doubt overtaking will ever be impossible in F1. I hope these cars don't place more emphasis on DRS. Looks like the new boys are doing an OK job in testing at least, All four of Ocon, Stroll, Giovanazzi and Vandoorne are new bloods. You've ruined F1 with that statement Nate. No race for Abu Dhabi this year. I'm cancelling it. I always thought Honda had an advantage as they got to be spectators to the 2014 season and they could see the advantage mercedes had and more or less what they did with the engine. I would have thought it was a no-brainer to copy the concept and implement it. The biggest problem for Honda was that it lost a whole year of testing and races, and came into 2015 a year behind and having only gathered data on the dyno. There was also poor communication between Woking and Sakura, meaning Honda had to shove its engine into McLaren's small size zero concept chassis, which led to its own problems. Add to that the token system and you have a perfect (or imperfect, if you're McLaren) cocktail for disaster. Honda's engine performance last year matched the 2015 Ferrari before the end of the season, suggesting if it had come in for 2014 it could have at least pushed Mercedes for wins. I heard the PU was changed on Vandoorne? @Openthedrs: Yep, they completed it earlier this hour. Expected back on track before the chequered flag later. @Laurence Why did Williams take Massa rather than reserve driver who if I'm not mistaken is Di Resta right? @Openthedrs: Williams wanted an experienced driver to come in considering the 2017 cars are a much more difficult breed of car, and considering they'd given the other seat to a teenager in Lance Stroll. They probably thought Di Resta had been out of the sport for too long. No-one has surpassed 100 laps individually yet, but Mercedes has if you combine their two drivers. They're currently on 172, the next closest are Raikkonen and Magnussen, who are both on 92. Ignore that - my bad eyes again. I read Raikkonen's laps as Hamilton's. It's been a long day. @fernandoalonso: Sorry Fernando, probably not. So Di Resta is the Badoer of Williams? Look how that turned out... I couldn't believe how slow both him and even Fisi were in the Ferrari. Were Kimi and Massa THAT good?? @Nate do you think a lot of Mclaren Honda s concerns are more than they seem. As in there must be a huge cultural differences in the companies and the way Mclaren must be used to with doing things in a certain way, Honda might not. I mean lot of the issues seem very usual something most of the manufacturer's have already addressed and hence are not facing any issues. It must be a frustrating time at Mclaren. They must be in a situation where they are embarrassed but bash Honda nor are they happy with them. @Mcf1: Cultural differences definitely play a big role in it, I think McLaren and Ron Dennis underestimated how big they would be, especially given the success of the partnership in the past. Vandoorne has been back out there for his 30th lap and his first of the afternoon. He returns to the pits, as is customary after an installation lap. Now how many can he complete in the next 65 minutes? Did McLaren say what caused SV2's stoppage earlier? @JasonArellano: We only heard that it was a loss of power, and that an investigation was ongoing. On the overtaking note, I like when it really becomes a skill again. I am Dutch so obviously biased... but both Jos and now Max always find gaps, even in Monaco. A lot of the current drivers lack the dog skill in my opinion. Hopefully stewards allowing more racing; I want to see drivers attempt 'Do or Die' again, it's racing after all! @Win: I agree. Overtaking ability tends to be what separates the great from the good. We're heading towards the final hour of running, so it's time for another updates to those times. @Nate: How are these times updated? I suspect low tech viz manually copying from the large timing screen in the media center? !